Another episode of NBC’s Saturday Night Live, another aim at President Donald Trump. This time they mocked the POTUS over his declaration of a national emergency, all due to funding for his long-sought wall along the US-Mexico border. 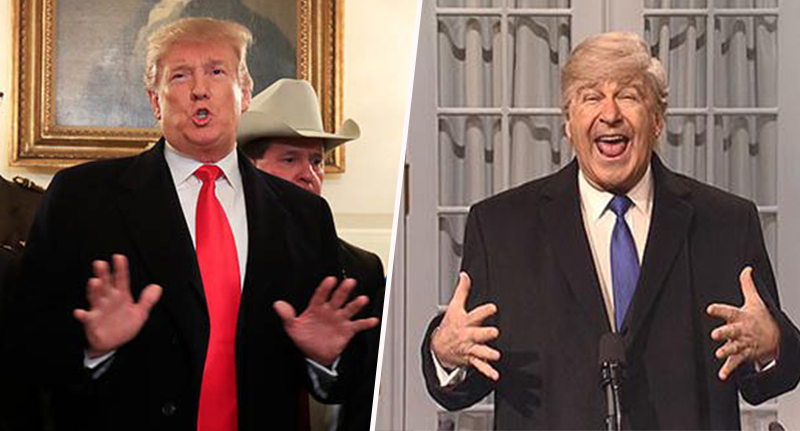 Actor Alec Baldwin, in his usual Trump-esque get-up, closely mirrored Trump’s comments, which he delivered in the White House Rose Garden two days ago – although you might not have seen if you were watching on CBS as they cut him off after 20 minutes. The sketch has obviously hit a nerve with the POTUS though, as he’s taken to Twitter – as he so often does – to hit back at the show, as well as the station. Ok Donald – whatever you say. However, with Trump reacting to the sketch, many have used it as an opportunity to mock him for being wound up over ‘humorous satire’. Whoa. Saturday Night Live is humorous satire. Trump’s personal anger against freedom of speech and dissent in our country is reminiscent to North Korea’s Kim Jong Un and Russia’s Putin. Trump is becoming increasingly unhinged. This is very concerning. Alec Baldwin’s Trump comes off as smarter and more likeable than the actual trump. Let’s be honest though, if you can’t laugh at yourself, who can you laugh at? Also, Baldwin’s been doing his Trump impressions for quite a while now, so it’s weird the POTUS has only started responding now. Definitely hit a nerve!